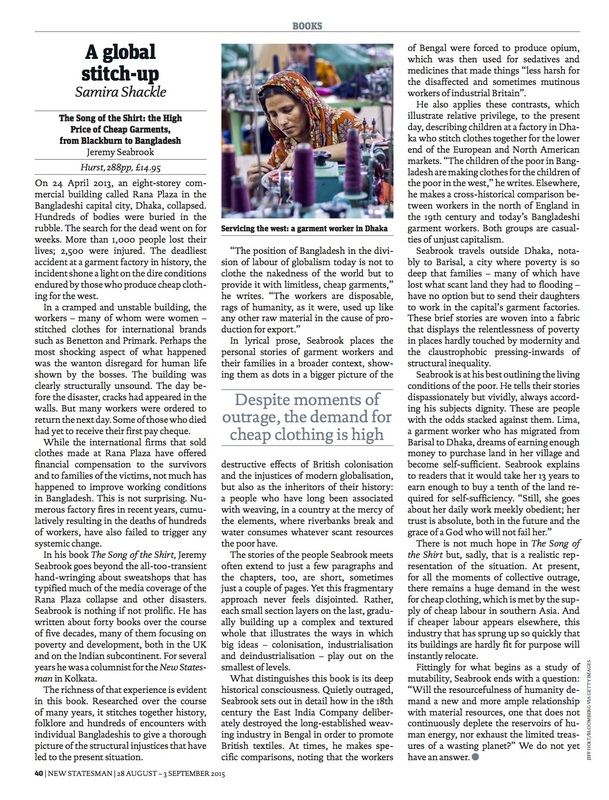 For a recent issue of the New Statesman magazine, I reviewed Jeremy Seabrook’s latest book, The Song of the Shirt, which looks at the Bangladeshi textiles industry. Here’s an excerpt, and the clipping is below. You can read the full piece over at the NS website. In lyrical prose, Seabrook places the personal stories of garment workers and their families in a broader context, showing them as dots in a bigger picture of the destructive effects of British colonisation and the injustices of modern globalisation, but also as the inheritors of their history: a people who have long been associated with weaving, in a country at the mercy of the ­elements, where riverbanks break and ­water consumes whatever scant resources the poor have.